In the Category list, click Fraction. In the Type list, click the fraction format type that you want to use. The number in the active cell of the selection on the worksheet appears in the Sample box so that you can preview the number formatting options that you select. 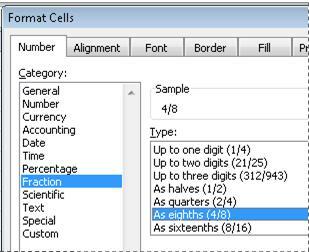 After you apply a fraction format to a cell, decimal numbers as well as actual fractions that you type in that cell will be displayed as a fraction. For example, typing .5 or 1/2 results in 1/2 when the cell has been formatted with a fraction type of Up to one digit. 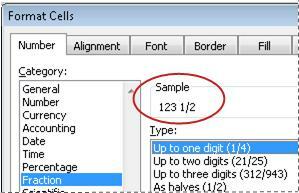 If no fraction format is applied to a cell, and you type a fraction such as 1/2, it will be formatted as a date. To display it as a fraction, apply a Fraction format, and then retype the fraction. If you don't need to perform calculations on fractions, you can format a cell as text before you type a fraction into it by clicking Text in the Category list. This way, the fractions that you type will not be reduced or converted to decimals. However, you cannot perform mathematical calculations on fractions that are displayed as text. To reset the number format, click General in the Category box (Format Cells dialog box) or in the Number Format box (Home tab, Number group). Cells that are formatted with the General format do not have a specific number format.